Living the Farm Sanctuary Life: The Ultimate Guide to Eating Mindfully, Living Longer, and Feeling Better Every Day By Gene Baur and Gene Stone (author of Forks Over Knives) is available from FarmSanctuary.org, Amazon, Barnes & Noble, Books-A-Million, etc. 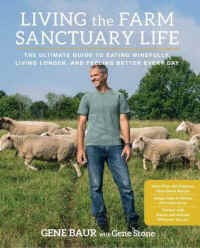 Gene Baur lives out his ideals by rescuing and raising farm animals at the nation’s leading farm sanctuary that he founded in the late 1980s; and, to top it off, he is a best-selling and elegant writer—author most recently of the Living the Farm Sanctuary Life, which is just out in paperback. His book is a rare combination of attributes. It’s a strong plea for a plant-based diet, a guide to animal-friendly consumer and environmental ethics, an overview of farm-animal sentience, and a range of recipes that help us put our values on the plate in an especially delicious way. My favorite recipe section is “handheld meals”—and the Just Mayo chickpea salad sandwich (p. 164) has become a go to (in fact, it’ll be my lunch today).What comes through powerfully in this book is the inspiring notion that—and I admit to doing battle with this idea—individual choice matters when it comes to creating a better world for animals. “I believe that everyone can make a significant change in their lives when they’re ready to make that change,” Baur writes. Don’t let the simplicity of the statement fool you. After reading this book, even the most worn skeptic will be softened to the possibility. Gene Baur is co founder and president of Farm Sanctuary, America's leading farm animal protection organization. Gene Baur has been hailed as "the conscience of the food movement" by TIME magazine. For 25 years he has traveled extensively, campaigning to raise awareness about the abuses of industrialized factory farming and our cheap food system. Gene's latest book, published by Rodale, Living the Farm Sanctuary Life: The Ultimate Guide to Eating Mindfully, Living Longer, and Feeling Better Every Day, is available for sale April 2015. His previous bestseller, Farm Sanctuary: Changing Hearts and Minds About Animals and Food, was published by Touchstone in March 2008.